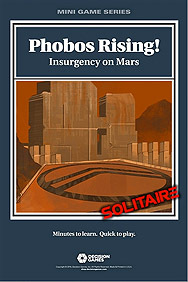 Phobos Rising is a solitaire game depicting the heroic actions of an elite team attempting to secure key facilities on Mars. Success means Mars has been secured and the Martian Revolution, depicted at the start of the Free Mars game, begins with a general uprising across the colonies bases and ships in the Solar System. The player starts with a handful of team members and a few gear enhancements. Four increasingly difficult missions must be completed to win the campaign game. Moving across a map depicting the Martian geography from Olympus Mons to Valles Marineris, Earth Federation forces will attempt to stop the team from completing its missions. Your team will be able to recruit additional members, obtain specialized gear to enhance skills, and acquire shuttles to speed movement. A unique card system counts down the time remaining and provides both challenges and opportunities at every turn. In this game the player takes command of a Rebel team attempting to complete missions critical to initiating the Free Mars Revolution. Your success will help ensure Mars is secure from Earth Federation forces and ready to support the Rebel fleet gathering overhead. This game is set in the Free Mars universe and is a prequel to the Free Mars boxed game.